This is the last article in the butterfly series. … and this article is on Short Put Butterfly Strategy. Note that the Long Call and Put Butterfly strategies work when Nifty expiry is very near the ATM strike that was sold. A credit is required to play the trade therefore the trade is called long butterfly. Short Call and Put Butterfly works when Nifty is more than 100 points away in any direction from the ATM strike on the expiry day. The trader gets a credit therefore its called the short butterfly. Unfortunately adjustments are costly and are not recommended. Since the risk and reward both are limited – basically a butterfly is a set and forget strategy. If it works – great, else you will have to take a limited loss. 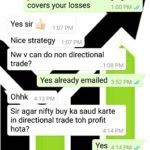 Mostly these strategies produce best results on the expiry day. And therefore should be traded 2-3 days before the expiry day. Since some kind of prediction is required, I personally do not like or trade these strategies. With the above in mind lets discuss the short put butterfly strategy. When Should You Trade a Short Put Butterfly? When your view is that the stock or the Index you want to trade will move at least 100 points away and hopefully will remain there during the expiry. Even if it does not move now, your view is that in due course of time Nifty will move away at least 100 points before expiry. This is a positional trade. 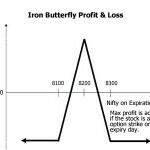 Therefore butterfly strategy should be traded when you have a strong view of the spot where Nifty will be on expiry day. Tell me how many times will you be correct? Its a neutral strategy, but high volatility helps because its a sellers trade and premium is the max profit. Let me get the real closing prices of the options that I will now show you as an example. Will treat 8000 as our ATM strike. Options prices are for options expiring on 30-Oct-2014. Note: It does not make sense to sell a lot with a premium of 3.30. I know people do it on the expiry day. Frankly it is not a good strategy to sell options on the expiry day. The risk-reward is pathetic. Just imagine even if you are getting 5 points – that is getting Rs. 250 in one lot for unlimited risk. Is that justified? This is off-topic – but if you are selling options on the expiry day, you are doing a big mistake. Yes it is great to see options you sold expiring worthless and those last few moments are so exiting. But are you trading for fun or to make money? What if something goes wrong? You may have a huge loss. There are better trades. Please stop selling options on expiry day. Ok. Coming back to the trade. Even though it does not make sense, technically to complete a short put butterfly, I had to do it. You know what I will do in such a scenario? Being very practical, I will do the rest of the trade but not sell 7900 PE. There are still 2 days left for expiry. I don’t need that Rs. 165/-. That is the max I would gain and frankly it does not bother me. So I will take my chances. What if next day Nifty suddenly moves down 50-60 odd points, or gaps down 100 points? May be that OTM option will then become 30 or even 50. I will then sell that option and complete the Short Put Butterfly trade. That way my returns will be more. This is called legging into a trade – but lets reserve this for another day. If you have read the other butterfly trades I have written in my website, you would have realized by now that the butterfly trade is a set and forget trade. You should set it near expiry and close it at around 3.15 pm on the expiry day. Assuming that we waited for the expiry day, lets calculate our max profit and loss. Anywhere above 8100 closing the results would have been same. Anywhere below 7900 closing the results would have been same. Assuming Rs. 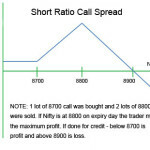 25000 is blocked for 1 lot Nifty option shorting. 2 options were shorted = Rs. 50,000.00 and Rs. 1620 for the option bought. Total margin blocked = Rs. 51620. This means you are risking 6.08% to make 3.59%. For some this is good risk-reward, for some it may be bad. For me it does not matter, since this involves predicting I would rather not trade the Short Put Butterfly Strategy. This does not mean you should never try this strategy. 1. Trade when the expiry is near. Why? Because this is a set and forget till expiry day trade. Your money will be blocked for a long time if you trade much before expiry and risk-reward will be almost same whenever you trade. Why would you block your money for so long? I would trade this just 3-4 days before expiry. 2. Trade when volatility is high. Why? Because you get high premium. Yes you also pay more for buying the ATM options – but if volatility is high you may also get more premium. 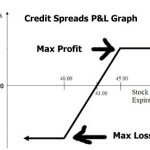 Remember the total credit on the day you trade is your max profit. This was a big news awaiting Indian and world markets. This news was coming just a night before the expiry day. Thus during such times the short put butterfly and the short long butterfly trades becomes excellent trades, because there is a high chance that Nifty will move someway or the other. For example today Nifty closed at record highs. It closed almost 1% up from yesterday’s closing. It closed at 8169. 4. If you are getting negligible premium by selling one leg of the trade, you can wait to sell it another time for a better premium. But the choice is yours. In the above case we would have lost that 165 Rupees. Any Adjustments for the Short Put Butterfly Strategy? No. Set and Forget. The results will come on expiry day. You know your max risk and max reward, why bother with adjustments. If you rollover your trade then only your broker will make money not you. 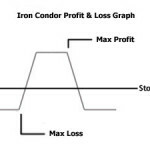 So Should You Not Take Any Stop-Loss As Well? Well frankly this is very tricky to answer. If Nifty does not move, you will start getting bit nervous. If your max loss is something that you can digest, my suggestion is that its better to leave the trade for the expiry day. For example today itself Nifty moved 1%, almost all of that intraday. Had a trader taken a stop-loss in the morning he would have felt bad. And interestingly that trader would have blamed his bad luck because Nifty moved after he took a stop loss. Was it really his bad luck? Or he did not have patience? Therefore trade with limited number of lots and max loss you are comfortable with, and leave till 15 minutes before expiry. That ends the series on butterfly trades. Have you ever traded the butterfly. I am sure most of you do. If yes what did you trade? Did you make a profit or loss? Do let me know in the comments section. Note: From tomorrow Nifty Lot size will reduce from 50 to 25 and the margin blocked will also drop by 50%, so please calculate the profit and loss accordingly.